Well thanks for all the piss take replies. This is the exactly sort of defeatist attitude and lack of imagination that keeps us in chairs. Are you seriously telling me that in the year 2018 with One Billion dollars in your pocket that you could not somehow circumvent some of the red tape and legislation that is in place? I know this was not a "serious" thread but to be honest I expected more from some of you. So I would set up a research organization that does SCI CURE research 24/24 7/7 365/365. That could potentially put the academic system out of business and drive money to who can deliver the needed descoveries in a much faster and cheaperway. At the same time I would set up an X-prize approach to find a cure. Unfortunately Paolo and Moe are spot on. Until there is a hero for us we have to follow the current approaches. Any foundation that is run by someone without a chronic injury can never truly understand. Regardless of association to someone, they can never know. PM me if you want a copy of what I wrote. Decades of research, many breakthroughs were reported in the past but yet we wonder nowadays "Hey it's F'in 2018! How is it possible this cure is not out yet???" What if... The cure already been found, the recipe got recorded for Elite use, The researcher DID get the prize AND got paid extra or got life threatened or even got KILLED to SHUT UP by the elites who depend on SCI market's mass revenue? Just keeping an open mind, I know it may sound crazy but can't ignore that this can be a possibility. Hey, the cure for world hunger and so is for the dependency for fossil fuels is been around for decades too... and these are a lot easier! Last edited by Moe; 06-24-2018 at 06:23 PM. What if... The cure was found, the recipe got recorded for future use, The researcher DID get the prize AND got paid extra or got life threatened or even got KILLED to SHUT UP by the elites who depend on SCI market revenue? Sounds crazy and is crazy. There is no cure for SCI. And there is no one wanting to keep you paralysed for their own financial benefit. Fair enough. But how do you know this to be a true fact? Its fine if it's just a personal belief, but the 2 are not the same. Sometimes things are not what it seems. Can't believe everything unless you've seen it yourself. Don't worry, I'm not trying to convince anybody. But if you know for a fact, a direct whiteness then please share more details, I beg you. Fortunately, worst case scenario, Devices, Stimulators and drugs are more likely to up come to improve our lives as long we depend on it in long term and fill their fat pockets... a cure would be a big danger to the empire that uses us for financial gain. Last edited by Moe; 06-24-2018 at 07:14 PM. 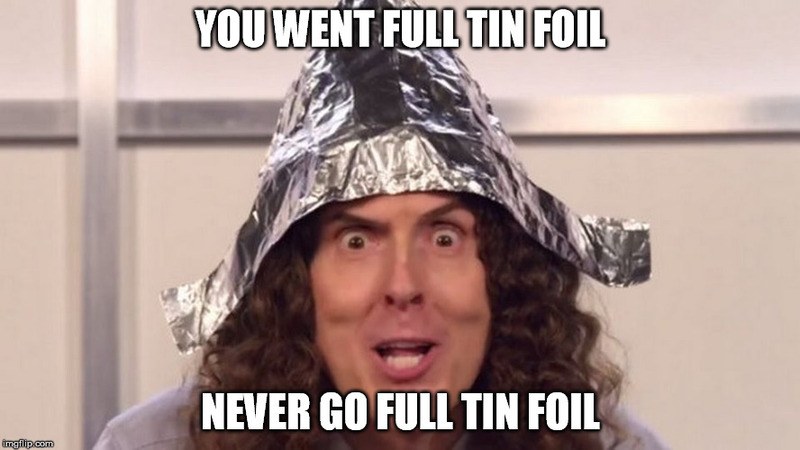 Tin foil is good treatment for the brainwashed who can't differentiate Facts vs. narrow-minded personal opinion? I prefer to keep an open mind than to be a tin foiled brainwashed fool. Sorry to get you triggered, I didn't intend to mess up your wishfull thinking. Last edited by Moe; 06-24-2018 at 08:00 PM. That made me lough for long time! Please consider ignoring the "ungrateful and paranoid prick" (he is just what he is) and repost your great picture/analysis of the situation, I am confident there are many who understand what you are saying. Only because you laughed today Paolo! I don't buy into the idea that there are unscrupulous individuals or groups that want to keep us paralysed. I can see how it's easy to think that but I don't think it is actually true. It's a very difficult issue to solve with just money. Academic research is riddled with politics, egos and cronyism. Hospitals (moreso in the US) are big business and often distort the cost and timelines of clinical trials. The Pharmaceutical industry is struggling to re-organise itself to deliver new technologies that are bit more complex to deliver into the body. Perhaps some of those younger talented researchers who accept they may never get tenure at an academic institution can be given a different platform to deliver value? Many of those same researchers may choose, if brave enough, to take the open science and big data/machine learning route to collaborate, share and create new insights and hypotheses? I'd wager they would produce a lot more useful science not having to worry about writing grants, playing politics and waiting for 12-18 months for a journal to be reviewed (sometimes by a competing scientist). Perhaps these same researchers can work and plan projects as us normal folk do rather than in line with the shorter academic calendar? Perhaps we can see animal models standardised and studies (and replication studies) farmed out to contract research organisations that can setup and turn around trials quickly? Perhaps these researchers can follow a transparent fail-fast approach rather than be obligated to complete the whole project, write it up and submit it for review? Perhaps clinical trials can be done differently? Perhaps the rehab associated to a trial can be done in more cost effective outpatient Community rehab facilities instead of expensive inpatient settings? Perhaps data can be collected by wearables and apps? If outcome measures were more accurate perhaps we wouldn't need such large or restrictive studies? Perhaps health startups can be funded through crowdfunding, social impact funding or venture philanthropy? Perhaps the board makeup can include people with SCI? Perhaps the cost of making clinical grade materials can be reduced so startups are not over leveraging themselves building their own GMP labs? I also do not buy into the theory that the market is too small for investment. Spinal cord injury not only directly overlaps with many other neurological conditions but the science also indirectly overlaps with age-related illnesses, dementia and even life-extension. And guess what billionaires really really want? To live longer to spend their money of course. There's also a possible indirect relationship with sporting performance - hey, which sportsman/woman doesn't want more or better performing neurons and motor units? We need to do some serious market making. At the moment we as a community are just not thinking broadly enough. Soften the lines at the edge of spinal cord injury and you'll see the market is massive! Yes money helps but there's more work to be done by the community to disrupt the current tradition of repeated failure.